Coverage: Live on ITV, BBC Radio 5 live Sports Extra, BBC Radio Scotland, BBC Sport website and BBC Sport app, plus live text commentary. Chris Paterson hopes Scotland can finish the Six Nations "with a bang" by registering a first championship victory in Ireland since 2010. After victories over Italy and France, the Scots are aiming to record a third straight championship win for the first time in 20 years. "The game will come down to two or three points," Paterson said. "It'll be a huge challenge, but to finish the championship with a bang is what I hope Scotland will do." 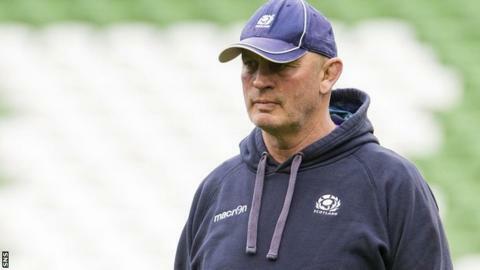 Paterson has been impressed at how Vern Cotter's men responded to the defeats to England and Wales to record back-to-back wins over Italy and France. "The English game first up was a wee bit disappointing in the sense that it was a fairly mundane game and England did a job on us to come and win," Paterson told BBC Scotland. "But I thought we played pretty well in Wales, didn't get the result, and in the last two fixtures against Italy and France have had really good performances and two cracking results. "I think we look ahead with a lot of optimism. It's very difficult to play away from home in the Six Nations. Difficult in Ireland, we've only won there once in recent times, in 2010. "They're unbeaten in their last eight home games in the championship. So it's a big ask, but if they play like they did last week the Scottish lads, with added accuracy, I think we've got a real chance." Scotland's scrum has developed into a potent weapon during this Six Nations, and Paterson feels that could provide the platform for the attacking runners in the back-line to do some damage against the Irish. "With our dominant set-piece - our scrum is outstanding - and some of the individuals playing in attack, Stuart Hogg etc, if these guys get their hands on the ball I think we can challenge anybody in the world and certainly Ireland this weekend. "They know the Irish players with most of them playing in the PRO12, they know their strengths, they know their weaknesses. Ireland will be looking for a big performance as well. They're currently second bottom in the championship with one win and one draw. "Jonny Gray is going to be a huge miss. Jonny has incredible stats in carries and tackles. His work rate is tremendous. "Tim Swinson's an able deputy but they'll lose a bit of out-and-out quality with Jonny Gray because he is one of the best players in the world."